*The same could be said concerning all divine agencies being unable to wipe-out karma. Even the Great God Jehovah can only obstruct it, but never dissolve it away. The second effect is that they would abstain from all further evil, in order to avoid estrangement from the Buddha as well as being able to avoid the need for remorse in the future. This leads us to the main focus of this blog and that is final cessation of all karma, kammanirodha. This was the main hope, for in Buddhism this occurs through a direct intuitive realization of nirvana. All that we are is the result of what we have thought; it is founded on our thoughts, it is made up of our thoughts. If a man speaks or acts with an evil thought, pain follows him, as the wheel follows the foot of him who draws the carriage. But if a man speaks or acts with a pure thought, happiness follows him, like a shadow that never leaves him. tail of causal reality and rebirth. follow you like a deathless shadow. So it follows suit that within Buddhism, the real significance of the doctrine of karma and its fruits lies in the recognition of the urgency to put a stop to the whole process. 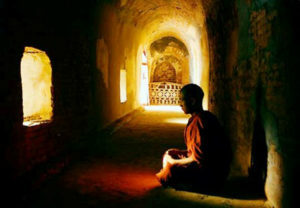 When a Noble Disciple understands kamma, the origin of kamma, the variety of kamma, the resultant of kamma, the cessation of kamma and the practice leading to the cessation of kamma, then he fully understands the noble practice which leads to the complete destruction of defilements and final cessation of kamma. As an aside it’s interesting to note that the Jaina tradition conceived of karma as something like dust which sticks to the soul (jīva). The road to liberation consisted in the gradual removal of all of this dust until the purified soul, free from the last traces of karma, rises to the highest level of the universe. This reinforces a fundamental of what it means to be a Buddhist. The Blessed One said, “Be an Island unto yourself”. There is no “personal savior” here. One is exclusively responsible for one’s own actions and will pay a karmic penalty for the consequences of those volitional acts. In light of this the effectiveness of any Vedic sacrifice discussed in the last blog is denied. The Buddha also rejected self-mortification as a means to acquiring good kamma, and as a way to Nibbāna. In his own quest for enlightenment, he came to realize that austerities can be more of a hindrance than an aid. In their stead he came to favor a middle path between self-mortification and the life devoted to sensual pleasures. For all the attention given to kamma in early Buddhist thought, the way to Nibbāna, the ultimate goal, remained—as ordinarily conceived—precisely the cessation of kamma (kammanirodha). This entry was posted in Karma and Rebirth and tagged avyākṛta, cetanā, Dhammapada, Jaina, James P. McDermott, Kamma, Kammanirodha, Mahakammavibhahgasutta, Nibbedhika Sutta, pāṭihhoga, Sutta Nipāta, Vasubandhu, volitional acts. Bookmark the permalink. Thought affects the pure essence of the Unborn Mind, like sound forms waves of various amplitudes and frequencies. Hence what is created as an original thought, that by its self-empty illusory nature never can be undone, is dispatched into the vast and highly dynamic medium of the imageless, like throwing a stone in a lake, or shouting in a great cave and listening to the inevitable echo of one’s own voice. This risen ghost, once returned, matured after a short or long journey, collides with new waves, forming wholesome or unwholesome conditions (Interference), affecting the mind and body of the Spirit and original thought creator, that acted unenlightened of its true nature and body of no position. Because of this bond to what is positioned in the illusory web of samsara, the strength of the bond determines the degree of ignorance and suffering of said Spirit. Here even pleasure of the heavens has its own inevitable distress and suffering as what is given, slowly is seen by the divine eye to fade away until its gone and replaced by something far darker and unwelcomed. What is free from any created and bonded position subject to form, sensation, mentation, volition and the consciousness found in the former, is subject to no karma for here we find no point of a beginning, and hence, no point of an ending.